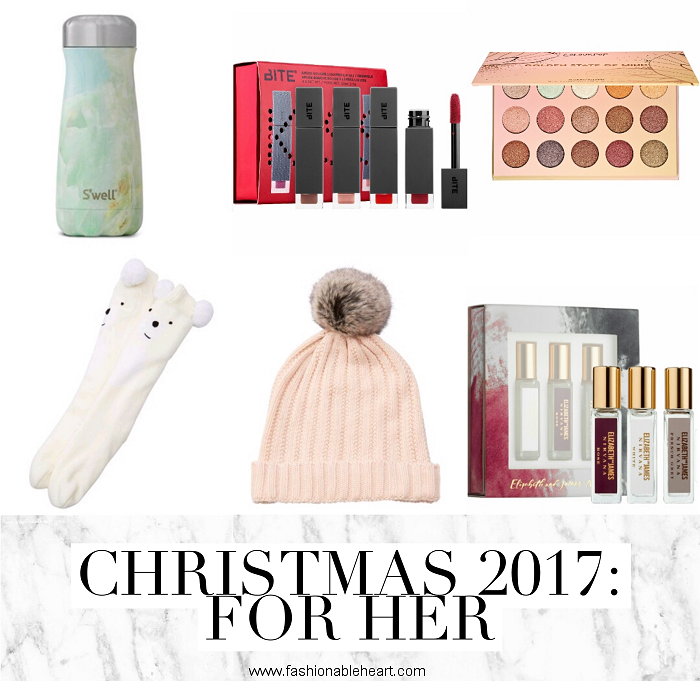 A little late getting the rest of my gift guides up this year, so I've combined the last two into one post. Besides, I can't be the only person who is still shopping at this point. Right? I'm early for everything except Christmas shopping. Never fails! Here are a few ideas for what to get for the girls and boys in your life. Nothing I linked to specifically is over $50 CA. Water Bottle - I personally love the S'well brand and I like this new shape they offer. Throw a bit of ice in and these keep my water ice cold all day long. I tested it when I first got mine and it averaged 26 hours before the ice was completely gone and the water started to go to room temperature. Makeup Set - I love sets like these. You can gift the whole thing or break it up into smaller gifts for more people. Eyeshadow Palette - You can't go wrong with palettes. You can find them at various price points and there's something for everyone. Reading Socks - I can't think of one person who hasn't gotten socks or slippers at least one holiday. And you better believe that I found the polar bear ones while making this list and now I need them in my life. Obviously (hi, I'm Wendy and I'm obsessed with polar bears). Pretty Winter Gear - I am a firm believer that you don't need to spend a lot of money on cute gear for colder months. I've ruined too many expensive scarves because the dang things get caught in jacket zippers. Hats and gloves fall out of pockets and into snow. The hassles of winter! Fragrance Set - Fragrance is such a personal thing, but the receiver of a gift like this is likely to find something they like. Google Chromecast - I love mine. Actually, make that LOVE. Capital letters are needed. It's just so convenient for Netflix, YouTube, watching things from your phone...I keep hoping Twitter will update their software so that I can also watch Twitter Live. Die Hard Christmas - My husband is in the "it's a Christmas movie" boat, while I most certainly am not. He feels like this book proves his point. Bob's Burgers CD - Or any music they like. My husband and I happen to be obsessed with Bob's Burgers and he was pretty excited when this soundtrack was announced. Where are all of my Bob's Burgers fans at?! Oh, nice things are nice! Portable Charger - Always needed. Reading Socks - Lined with fleece to keep his feet super warm. Hobby/Book - Going off of a hobby will never lead you wrong. My guy happens to love Archie, because that's what he grew up on and it always takes him back. 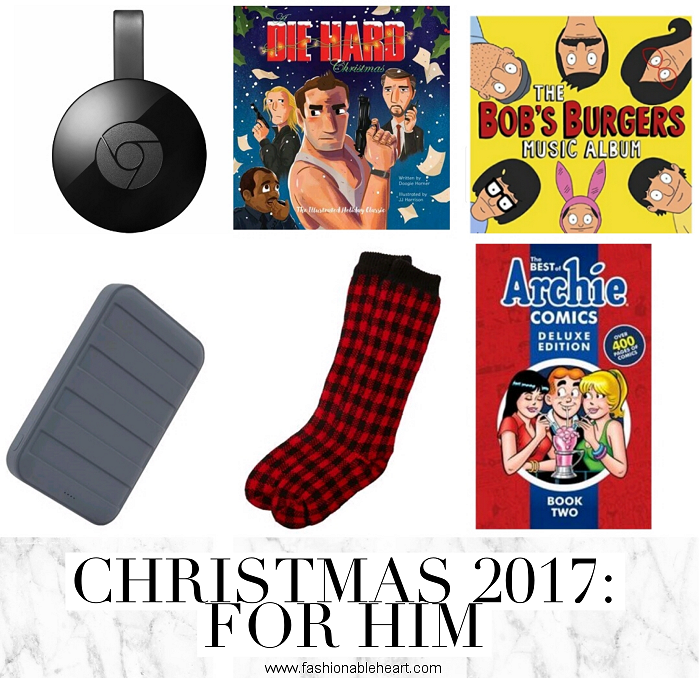 I get him at least one Archie book every Christmas!